A common unit can be utilized for single- and two-speed applications in the 230V/460V design for up to 15.2 amps. The 575V model is similarly designed with single- and two-speed capability in a common unit for up to 15.2 amps. 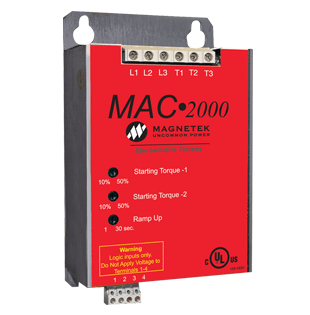 MAC•2000 has been designed specifically to recognize the high duty cycle start, stop and jogging conditions that are associated with overhead material handling applications. The versatile design of this motor acceleration control reduces the need to maintain inventories of units with various voltage and speed capabilities as is seen with other soft start manufacturers. In addition, this unit has been produced to recognize the needs of our customers for a low cost control device for less sophisticated applications. Check out the additional features included in our MAC•2000 control and include it as part of your next crane control solution. 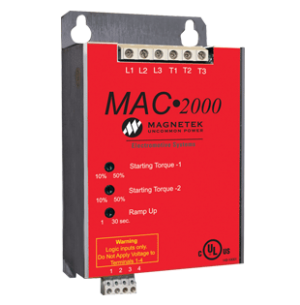 MAC•2000 can be easily applied to an existing contactor on a crane for single- or two-speed applications, or it may be ordered to use with an Electromotive Systems pre-engineered contactor panel.